This official Student Solutions Manual includes solutions to the odd-numbered exercises featured in the second edition of Steven Strogatz's classic text Nonlinear Dynamics and Chaos: With Applications to Physics, Biology, Chemistry, and Engineering. The textbook and accompanying Student Solutions Manual are aimed at newcomers to nonlinear dynamics and chaos, especially students taking a first course in the subject. 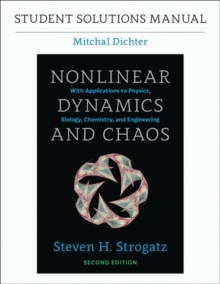 Complete with graphs and worked-out solutions, this manual demonstrates techniques for students to analyze differential equations, bifurcations, chaos, fractals, and other subjects Strogatz explores in his popular book.